Synopsis: Describes how a dinosaur eats, with no rude noises and while sitting very still. Hi again friends! It’s Miss Erin, your friendly neighborhood librarian here at Scaleybark Library. Thank you so much for joining me today. So, this is the time of year where we like to talk about food! MMMMMMMMM I love food, I love food, I love food! I love pizza! I love donuts! I love apples! I even love vegetables! I love all things related to food. Also, it’s a really great time to talk about manners too. So, when we think about manners, we think about words like please and we think about words like thank you. Now our storytime book today is called, “How Do Dinosaurs Eat Their Food?” And this one is by Jane Yolen and Mark Teague. And what’s super cool friends is if you end up loving this book there’s actually a whole bunch of other stories in this series, so you can go on all sorts of fun dinosaur adventures. Should we go ahead and get reading? Let’s do it! Here we go! That was such a fun story! I love these dinosaur books, I think that they’re really, really, really great. Now the library has a whole bunch of other really great stories about food and manners and dinosaurs, so make sure you click the link below so check out our special booklist on subjects just like that. All of those titles are available at the library, so you can place your hold today! So, make sure you check those out. Also, grown-ups, this is for you! If you’re looking for your next Active Reading Quick Tip, just scroll on down and we’re going to be talking about “Connecting to Your Kids World,” where there will be questions and information about what exactly that means as well as a link to finding your very own, local, Active Reading Workshop as well as more information about Active Reading. Thank you so very much for joining me today everyone, I’m so glad you were here and please join me next month for another great story, another great Active Reading Quick Tip, and another great booklist. Make it a great day guys! Thank you so much! Did you love today’s story, How Do Dinosaurs Eat Their Food? Click the button below to discover more fun books about food, manners, and dinosaurs! What exactly is Active Reading? Active reading is a way to read with your child that we know builds their early reading skills. Active reading encourages kids to think about the book, teaches them new words, and connects books to their world. There are three key things that we call the ABCs of active reading: Asking questions, building vocabulary, and connecting to their world. Through these Active Reading Quick Tips, we hope to practice some of the things that you can do with a book with your child that research has shown to effectively teach early reading skills that will prepare kids for kindergarten. 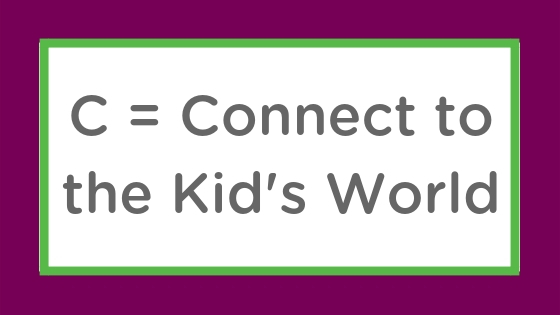 Making connections will extend the learning from the book to other contexts and make reading a relevant experience for children. Have you ever blown bubbles in your milk? Why did you do that? Why do you think the dinosaurs did that? How do you feel about the way the dinosaurs are behaving? Have you ever behaved the same way? Do you remember when we went to a restaurant? How did you behave when we went to the restaurant? Connection questions can ask about the events in the story, and then follow up with how your child feels or would feel in a similar situation or setting. As your child develops, they will be able to make more connections. You may have to answer your own questions while your child is young. This can take the form of telling the child stories about what you did or have done. Not every book you read must be about a familiar experience, but you can connect parts of the book with your child’s experiences. You can also discuss what your child learned or what they would like to do based on what they read. This helps children expand their language and thinking about the books even more. Are you interested in learning more about Active Reading or registering for one of our informative workshops? Click the button below to visit our website to find out more information and to find a workshop near you!